Running a 32bit or 64bit CPU? Sometimes Windows alone might not be able to tell you what your machine has. 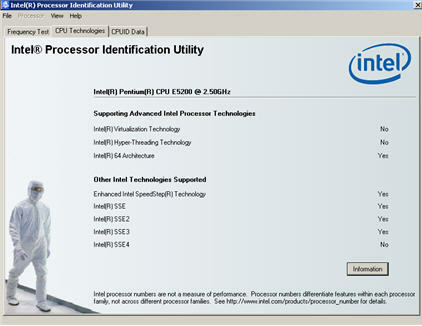 To be absolutely sure, if you at least know you have an Intel CPU, try their Processor Identification Utility. Certain advanced Intel(R) processor technologies require system support features be present to be fully enabled. Please see the notifications below for system features required to enable the listed technologies. 64-bit computing on Intel architecture requires a computer system with a processor, chipset, BIOS, operating system, device drivers and applications enabled for Intel(R) 64 architecture. Performance will vary depending on your hardware and software configurations. Consult with your system vendor for more information. Intel(R) Virtualization Technology requires a computer system with a processor, chipset, BIOS, enabling software and/or operating system, device drivers and applications designed for this feature. Performance will vary depending on your configuration. Contact your vendor for more information. Intel, Intel Atom, Intel Core, Pentium, Xeon, Celeron, OverDrive, SpeedStep and MMX are trademarks of Intel Corporation in the United States and other countries. Copyright(C) 2010, Intel Corporation. All rights reserved. ShinyLight Blog Running a 32bit or 64bit CPU?